Sons of God, or Sons of Mary? Does Mary's Foot Crush Satan's Head? "Queen Mother" Intercessor To The King? Gebîyrâh... "Queen Mother", "Mistress" Or Wife? Did The Queen Mother Wear A Crown? Did Solomon Pull up A 'Throne' For His Mother? Psalm 45:9... Mary Arrayed In Gold? Are We Sure We Want To Use The Mothers of Kings In The Old Testament as Examples of Mary's Role? Did Gabriel and Elizabeth's Words Signify Mary Had An Exalted Position? 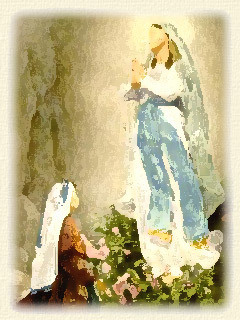 Why Did Elizabeth Call Mary Blessed? Who, According To Jesus, Is "Blessed" And Part of His Family? Part II... The Wedding at Cana, The Woman of Revelation 12, Grandiloquent Claptrap Replaces Very Impressive Scriptural Truths,The Magnificat. The term "Queen of Heaven" was not unknown either to ancient cultures, nor to the Scriptures. A number of goddesses in the ancient Mediterranean and Near East, bore the same title. The list is a lengthy one but, perhaps, two of the best known are Isis and Inanna, the latter known by many names. "The goddess who outweighed, overshadowed, and outlasted them all was a deity known to the Sumerians by the name of Inanna, 'Queen of Heaven,' and to the Semites who lived in Sumer by the name of Ishtar. In Sumerian, Inanna's name means "Queen of Heaven," ...in Sumerian mythology, she was known as Queen of Heaven and Earth...." . Although there is quite a bit of conflicting information out there, it is very likely that the goddess known to the Sumerians as Inanna, Queen of Heaven and Earth, was simply given different name by people from different regions. She was called Ishtar by the later Babylonians, Akkadians and Assyrians, Astarte by the Phoenicians, while the Israelites knew her as Ashtoreth. "the dead and resurrected god Tammuz (Sumerian Dumuzi), prototype of the Classical Adonis, who was the consort as well as son by virgin birth, of the goddess-mother of many names: Inanna, Ninhursag, Ishtar, Astarte, Artemis, Demeter, Aphrodite, Venus" . The title Queen of Heaven is twice mentioned in the book of Jeremiah and, although I do not think we can positively identify which of the goddesses is being referred to, it is likely that Jeremiah was speaking of Ashtoreth, a later name for Inanna, the ancient Sumerian goddess whose title was 'Queen of Heaven and Earth'. In any case, entire families were involved in the idolatry... the children gathered wood, the fathers kindled the fires, and the women kneaded dough to make cakes for the queen of heaven. It is very obvious that the worship of this "queen of heaven" provoked God to great anger. The fact that the title given ancient goddesses has also been bestowed on Mary should make any Christian extremely uncomfortable. However, many Catholics will tell you that this is not a carry over from the worship of an ancient goddess, which begs the question... where did the title come from? As previously mentioned, the ’queenship’ of Mary was formally established by Pope Pius XII in Ad Caeli Reginam, a 1954 papal encyclical, or letter, written in 52 points. In reading through the encyclical, one fact that jumps out is that it makes very few references to the Scriptures, but quotes from the writings of early church authors innumerable times. In other words, tradition, rather than God's word, took center stage. St. Andrew of Crete frequently attributes the dignity of a Queen to the Virgin Mary. And quotes him as writing "Today He transports from her earthly dwelling, as Queen of the human race, His ever-Virgin Mother, from whose womb He, the living God, took on human form". It also quotes Andrew of Crete who called Mary "the Queen of the entire human race faithful to the exact meaning of her name, who is exalted above all things save only God himself." Germanus spoke to Mary in these words: "Be enthroned, Lady, for it is fitting that you should sit in an exalted place since you are a Queen and glorious above all kings." John Damascene called her "Queen, ruler, and lady," and also "the Queen of every creature." (a) Hom. in S. Lucam, hom. VII; ed. Rauer, Origenes' Werke, T. IX, p. 48 (ex catena Marcarii Chrysocephali). Cf. PG XIII, 1902 D.
(b) S. Hieronymus, Liber de nominibus hebraeis: PL XXIII, 886. But this is hardly surprising since Origen, known for introducing Greek ideas into Christianity, often flatly contradicted the Scriptures. He taught the pre-existence of souls, the final reconciliation of all creatures (possibly even Satan), and the subordination of the Son to the Father. In fact, the Fifth Ecumenical Council (The Second Council of Constantinople) passed 15 anathemas against Origen's teachings, which can be read on this page of the web site ...http://www.ccel.org/ccel/schaff/npnf214.xii.ix.html. Yet, later popes didn't seem to have an issue with quoting him when it suited them. Jerome, who was a fourth-fifth century Latin priest, theologian, historian, and Doctor of the Church, states that "Mary" means "lady" in the Syrian Language. However, the New Testament was written, not in Syriac, but in Greek therefore, whatever "Mary" means in Syriac has no bearing on the matter. In Greek, the name Mary is Maria or Mariam, which came from the Hebrew Miryam. In turn Miryam is derived from merur which means bitterness or rebellion. Peter Chrysologus, Bishop of Ravenna from about 433, adds that "The Hebrew word 'Mary' means 'Domina.' The Angel therefore addresses her as 'Lady' to preclude all servile fear in the Lord's Mother, who was born and was called 'Lady' by the authority and command of her own Son". Perhaps we should stop imbuing etymology with preconceived ideas. 1) 'Mary' and 'Domina' are two vastly different words. I repeat... The name Mary is the Greek Maria or Mariam, which came from the Hebrew Miryâm which in turn is derived from merur (bitterness or rebellion). On the other hand, "Domina", is the female form of the Latin word Dominus... master or owner, from which we get the English word "dominate". Dominus was the Latin title of feudal lords etc, and a common prefix for parsons before the Reformation. The shortened form "dom" is sometimes used as a prefix of honor for ecclesiastics of the Catholic Church. Also, the word "lady" is not even hinted at in the New Testament. 2) The angel did not address Mary as "Lady". Gabriel's exact words were "Greetings, favored one! The Lord is with you." [Luke 1:28 NASB]. The word translated "favored" is the Greek charitoo, which means to grace or give special honour. It is used one other time in the New Testament where God is said to bestow grace on believers. 3) I would appreciate someone pointing me to where exactly in the Scriptures Christ commanded Mary be called 'Lady'. Miryam, an ancient Hebrew name, was quite common in the Old Testament. The Greek versions, Maria or Mariam (English Mary ), were equally common names among Palestinian Jews. Richard J. Bauckham, widely published scholar in theology, historical theology and New Testament studies, says almost 30 percent of women "bore one of the two most popular names, Mary and Salome",  which means that close to one in five women were called Mary, a fact that hardly leans towards placing any particular importance on the name. In fact, the name was so common, that several different women called Mary are not only mentioned in the New Testament but, although their identities are not completely agreed on, at least three were present at the crucifixion. In short, at least three of the men quoted in the papal encyclical, Ad Caeli Reginam, had their facts completely skewed. Yet, the average Catholic, reading this letter from the pope, would believe every word since they would assume that the pope and the men he quoted, knew what they were talking about. The New Testament refers to the 'sons of God' on numerous occasions, but are no references to anyone being called a 'son of Mary'. Catholics will argue that although Jesus is the one who will crush the serpent's head, Mary indirectly does so because she brought the Messiah into the world. She is the chosen instrument through which God crushes the serpent's head. While Christ actually does end Satan's dominion, Mary is the means by which He does so. Certainly Mary was the instrument used to bring the Messiah into the world, therefore in a round about way, she was the means by which Christ eventually finishes Satan. However, although the Scriptures simply state that God Himself will crush Satan, Catholics will go out of their way, and use every argument in the book, to place as much emphasis on Mary as possible. Many Catholics endeavor to show that Mary's exalted status is justified based on a supposedly significant role played by the mothers of various kings in the history of Israel. The logic being that when Christ, ultimately and eternally, takes His rightful place on the throne of David, Mary will, have the honor of being 'Queen Mother" in God's kingdom. Mary as the Queen of Heaven is tied in with the Old Testament concept of the royal household. Because the King had many wives it was impossible for one to be Queen. Therefore the King's mother served in the role. The Queen Mother sat on a throne at the King's right hand and helped rule the kingdom. Access to the King would often be through the Queen Mother and she would ask favors from the King for those who asked her. You can see an example of this in I Kings 2: 17-25 where Solomon is on the throne next to his mother Bathsheba. Gebîyrâh... "Queen Mother", "Mistress" Or Even Wife? In other words, the role of the gebîyrâh as mother of the king was an important one, since she was also supposedly mediator to the king. This has given rise to the belief that Mary intercedes with her son on behalf of those who petition her. However there are several problems with this concept, the first being that both gebîyrâh and a similar word, gebereth, are the feminine forms of gebîyr, which is used only twice in the Old Testament and does not, in either instance, indicate a "king". The KJV translates gebîyr as "lord", while the NASB and the CLV (Concordant literal version) render it "master". Additionally, the word gebîyrâh, also refers to a wife. In summary, gebîyrâh and gebereth simply mean 'mistress', while gebîyrâh can also be used of a 'wife'. There is no question that, in 1 Kings 15:9-13, it was definitely the mother of the king who was referred to as the gebîyrâh. The phrase 'queen mother' simply refers to the mother of a king. In the verse above, the NASB translation is quite ridiculous, simply because you cannot 'remove' someone from being your mother, regardless of what she may have done. King or not, Asa couldn't have done so. What the verse actually says that Asa "removed Maacah his mother from being mistress (Heb. gebîyrâh)", although we are not given the slightest hint as to what exactly 'being mistress' entailed. And, by the way, there is translation error here. Earlier in the chapter (Verse 1-3), we are told that Maacah was the mother of Abijam .... Asa's father, which means that she was probably Asa's grandmother, not his mother. . Apparently grandmothers were gebîyrâh, or mistresses, as well. Jeremiah 13:18, is a verse many Catholics quote in support of the belief that the king's mother, was important enough to wear a crown. Many assume her crown wearing meant that she also wielded authority, perhaps as counselor to the king. While it is entirely possible that this next verse is referring to the mother of the king, the original Hebrew word gebîyrâh (mistress) does not specify who this "mistress" is. Therefore, the NASB's rendering of gebîyrâh as "queen mother" is based on the assumption that the king's mother is being referred to. In any case, this verse is not as clear cut as it may seem. One has to remember that the entire chapter is a prophecy and, as such, involves a great deal of symbolism, which makes it far from certain that a real crown was involved. When it comes to royalty, a crown is usually a symbol of the position. Others place importance on the fact that, in the second book of Kings, it is stated that Nebuchadnezzar carried the king's mother into captivity. While it stands to reason that the mother of the king would have been an important person in the kingdom, the verse says the kings entire family, including his wives, his mother (Heb. êm), the officials and leading men of the land were ALL led away into captivity. There is NO particular emphasis on the mother of the king. In fact Nebuchadnezzar also took captive a bunch of other people. The incident is again referred to in Jeremiah 29:2 and, again gebîyrâh is rendered "queen mother", although it could mean the queen. Finally, while it may have been true that the king's mother played a more important role than his many wives, it was more often than not in the context of her efforts to get her son, rather than a son of one of the other wives, on the throne. I Kings 1 shows how Bathsheba thwarted Adonijah's (David's oldest living son) plans to have himself enthroned. Making more of these verses than the text actually says is a classic case of reading our preconceived ideas into the Scriptures. A second argument used in favor of the status of the king's mother is that when Bathsheba went to King Solomon to speak to him on Adonijah's behalf, Solomon rose to meet her, bowed, then had a "throne" set on his right for her. [1 Kings 2:19]. However, although the same word has been used for Solomon's seat, and the one he had set for his mother, it does not necessarily mean that both occurrences meant a "throne". There is no doubt that the majority of uses of kissêh are in reference to the throne of God, the throne of David etc. Additionally, when kissêh is used in Exodus 11:5 in reference to the Pharaoh, and in Jonah 3:6 in speaking about the king of Nineveh, there is little doubt that the word refers to a real royal throne. However, the Hebrew word used is kissêh also refers to a seat or stool. It is also used to describe what Eli the priest was sitting on near the door of the temple and, later, by the side of the road. In both cases it obviously meant some sort of seat. Note: I believe the 'other writer' is Modestus of Jerusalem, seventh century Orthodox Patriarch of Jerusalem. John's description of the throne of God is more than telling. He speaks of the "the throne of God", "God who sits on the throne", "the Lamb in the center of the throne", "the throne of God and of the Lamb" etc. However, although John even describes a great multitude standing before the throne, he says absolutely nothing about Mary standing at the king's right hand. "King's daughters are among Your noble ladies; At Your right hand stands the queen (Heb. shêgâl) in gold from Ophir". [Psalms 45:9 NASB]. If we are going to insist on going back to the Old Testament for examples of how the mothers of the kings wore crowns, were advisors to their sons, and interceded with them on behalf of others, let us not forget that at least one king (Asa) had an apostate mother, whom he had to remove from being mistress. Additionally, using Bathsheba's supposed intercessory role as a precedent is a very bad idea. When Adonijah, the son of Haggith and David's fourth son born to him in Hebron. [2 Samuel 3:4] came to Bathsheba and made one request that she intercede with Solomon on his behalf, because as he said Solomon would not refuse his mother [1 Kings 2:12-17]. The problem is that while Solomon treated his mother with all respect, he not only refused her, but also had Adonijah put to death that very day [1 Kings 2:24-25]. Besides which how do we elaborate and expand ONE incident, when one person asked Bathsheba for help, to mean that the king's mother had an 'intercessory role'. If Christ is the one mediator between God and man, it seems rather superfluous that there should also be a mediator between humans and Christ. What for? In any case the book of Hebrews advises us that we can, with confidence, draw near to the throne of grace, and that Jesus, all by Himself, can save "to the uttermost" them that come to God through Him. The author of Hebrews is also very clear... We need to keep our eyes on Jesus, which means keeping our eyes off everyone else. Sadly, this is a classic case of going to the Bible to 'prove' what you have already decided to believe. Gabriel said that Jesus would "be great" and would be called "the Son of the Most High". The Lord God would give Him the throne of His father David, He would reign over the house of Jacob forever, and His kingdom would have no end. [Luke 1:32-33 NASB]. The archangel was simply stating facts about Jesus. It is we who have presumed to use the angel's words to project some of Jesus' eminence onto Mary. "..blessed is she who believed that there would be a fulfillment of what had been spoken to her by the Lord." But what about Mary's claim that from that time on all generations would count he blessed. In fact, later on, Jesus reinforced Elizabeth's theology when He clearly stated that obedience to God's will was more important than being humanly related to Him. In saying this, Jesus clearly pointed out that in God's order of things, being blessed is a matter of hearing and obeying God's word. Similarly, when Mary and His brothers wanted to speak to Him, Jesus appeared not only to decline their request, but again pointed out that doing the will of His Father makes a person part of His (Jesus') family. Was Jesus making a point? Certainly! But it seems to be a one that many people today haven't caught on to. There are no blood ties in the Scripture (not even Mary's earthly ties to Jesus) that mean anything in terms of becoming a son/daughter of God. What counts is that every individual, regardless of whom they might be related to, connected with, or what church they may belong to, has to hear and keep His commandments. Most Christians take these words to mean that Christ was simply making sure that Mary would be well taken care of when He left. However, one has to consider that, for over three years, He and His disciples moved around quite a bit. As Matthew 9:35 says, they went through all the cities and villages. Matthew 4:25 also says "large crowds followed Him from Galilee and the Decapolis and Jerusalem and Judea and from beyond the Jordan". As far as we know, Mary was doing all right, during the years Jesus was not physically present most of the time. Was Jesus simply ensuring that she would be taken care of in her old age? Possibly. But, if we take into consideration how Christ phrased his words, we should in all honesty, look at one other option. Jesus said nothing to the effect of giving Mary into John's hands, which would have been an expression of safekeeping. Instead to Mary, Jesus said "Woman, behold, your son!" and, to John... "Behold, your mother!". The word translated behold, is used in the imperative for the purpose of calling attention to something. Jesus seemed to be telling her to look... at her son. It almost seemed that Jesus was appointing John to take His place as Mary's son, now that He, Himself was leaving to take His rightful place at His father's right hand. Ashtoreth was Baal's female counterpart and the supreme goddess of Canaan. Asherah, mistranslated as "grove" in the King James Version, was an Assyrian goddess, mentioned eighteen times in the Old Testament. It is likely that "The Asherah" referred to was a carved tree or pole, that represented the goddess, images of whom were made and worshipped. She also had prophets and vessels used in her service. The Mysteries Of The Rosary. Fifth Glorious Mystery: The crowning of Our Lady Queen of Heaven. Ad Caeli Reginam. Encyclical Of Pope Pius Xii On Proclaiming The Queenship Of Mary. Ubi Primum On The Immaculate Conception. Encyclical Of Pope Pius Ix. February 2, 1849. Richard Bauckham. Jesus and the Eyewitnesses: The Gospels as Eyewitness Testimony Hardcover. Wm. B. Eerdmans Publishing Company (November 9, 2006) Pg. 71- 72. Pope Pius IX. Ubi Primum (On The Immaculate Conception). CatholicCulture.org. Copyright © 2014 Trinity Communications. Fr. Dwight Longenecker. Mary Queen of Heaven- the Bible Tells Me So. Mark Brumley. Queen of Heaven: Pagan Divinity or Royal Mother of the Messiah? CatholicCulture.org.